I read an astonishing statistic the other day. A recent poll revealed that 85% of Americans “sometimes” feel stressed about money and 30% are “constantly” stressed about their financial situation. I guess I shouldn’t be surprised. I know I fall into that 85% category, and especially when the holiday season rolls around. With gift giving, parties, big dinners, and travel, holiday costs can add up quickly. In my recent post about reducing holiday stress, I learned I’m not alone. 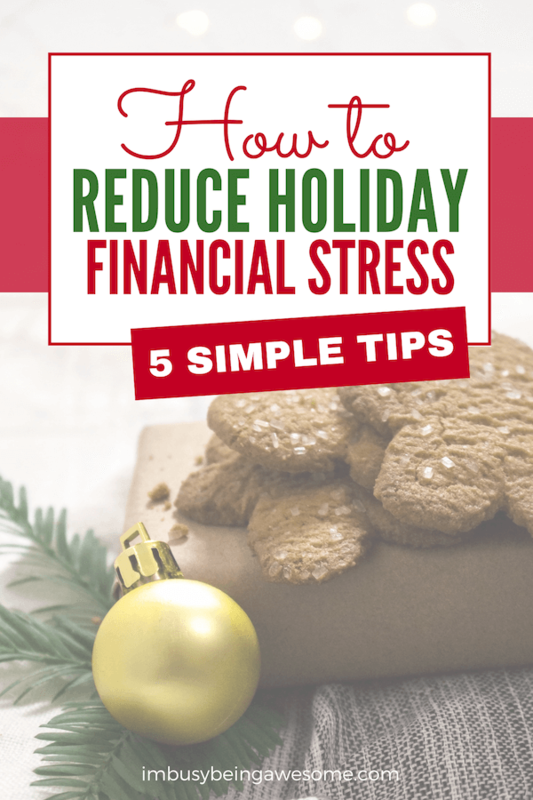 It seems that finances are one of the biggest holiday stressors for many of you wonderful readers. In fact, I heard from so many of you that I decided to dig deeper into this stumbling block and offer my five favorite tips to reduce holiday financial stress this season. Yes, this is an obvious suggestion, but it is also one that’s often overlooked. 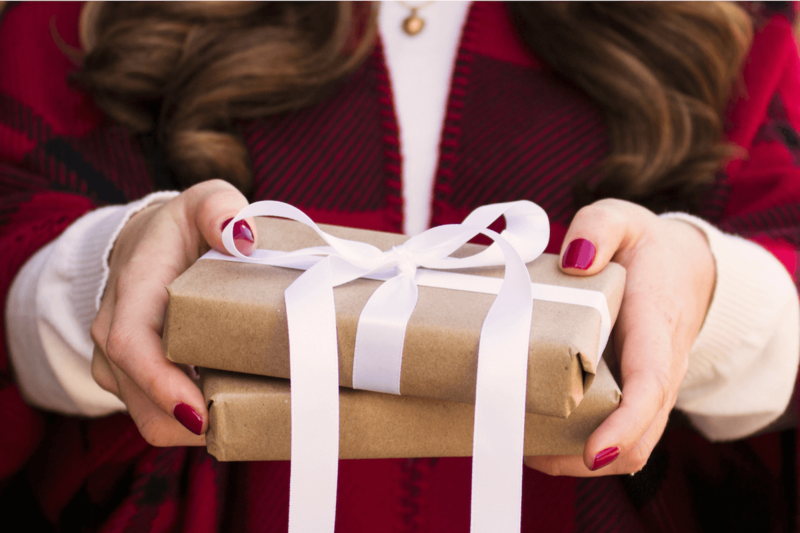 Many of us feel pressured to find the best gifts, host the fanciest parties, and “go all out” when it comes to the holiday season. 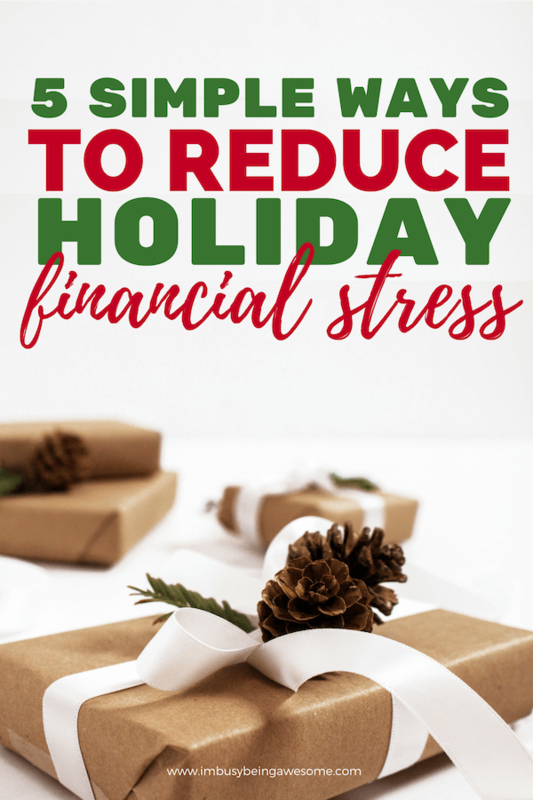 If you’re looking to reduce your holiday financial stress, however, I’m here to tell you that it’s time to set a budget. Review your current financial situation, consider your regular expenses, and decide how much you’re willing to spend on gifts, entertainment, food, etc. I recommend breaking down your expenses into categories and assigning each one a specific dollar amount. If you’re really feeling ambitious, withdraw that specific amount of cash for each category; when it’s gone, it’s gone. While money may feel like an uncomfortable topic of discussion, it doesn’t have to be that way. Talk openly with your close friends and family (those with whom you usually exchange gifts) and let them know you’re following a budget this season. By setting expectations early on – for both you and your family – you reduce the stress of worrying about whether you’re spending “enough.” Instead, you can focus on what’s really important: time with those you love. Though advertisements may suggest otherwise, remind yourself that spending time with those we love doesn’t have to be expensive. Yes, there are MANY wonderful holiday shows and experiences that cost a pretty penny, but there are also some incredible activities that you and your loved ones can enjoy for free. Admittedly, dehydrated marshmallows might not be at the top of your holiday activities list (to each their own😉) Nevertheless, I think you get the idea. Spend some time brainstorming affordable activities that you and your family love to do, and then schedule a time to do them. It’s as simple as that. It’s especially helpful during the holiday season to be mindful of where you’re spending extra money. Are there any non-essentials on which you can cut back? During the holiday season, I try to keep dining out, shopping, and extra entertainment to a minimum. Do I stop completely? No. But I am more conscious of where my money is going. It helps me keep my spending in check and reduce unnecessary financial stress. For example, if you make coffee at home throughout November and December, rather than buying a $5 latte before work each morning, that’s $200 you can put toward your holiday expenses. What a simple shift! Need more ways to save money? You got it. Look into carpooling to work; this would save on gas money and help the environment! Double win! You might lower the thermostat; according to Energy Saver, you can save anywhere between 5%-15% on your energy bill by turning down the temperature a few degrees when you’re away from home or snuggled in bed. Want to make some BIG cuts? Check out these 12 ways to lower your homeowner insurance and start saving big. 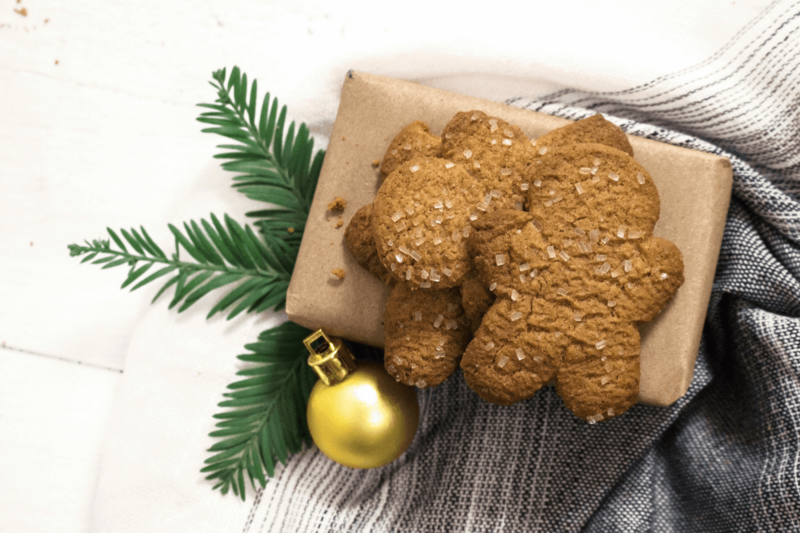 By finding extra ways to save your pennies throughout the holiday season, you help relieve the pressure of the extra money going toward gifts, travel, entertaining, etc. You’ve set a budget, you’ve established expectations with your friends and family, and you’ve identified fun and affordable holiday activities. Now it’s time to shop smart! If you’re a fellow online shopper, then I have great news for you. 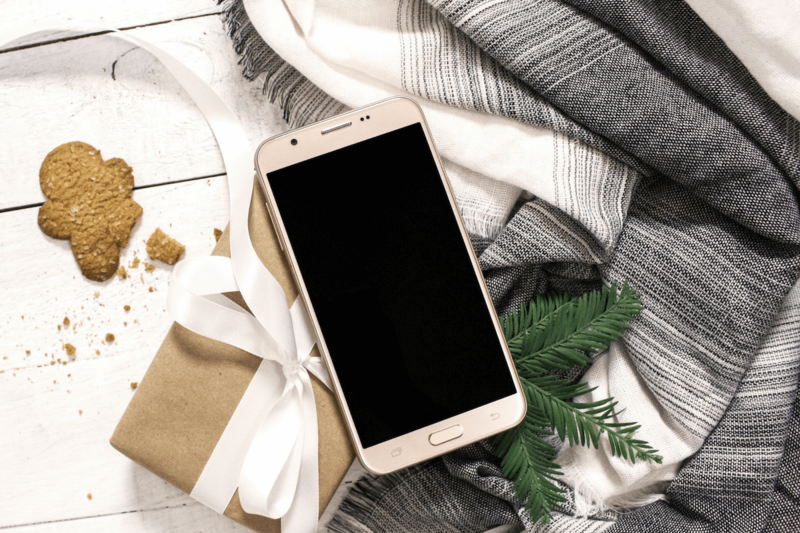 There are so many incredible resources out there to help you get the most “bang for your buck.” Here are some of my favorites to help reduce holiday financial stress when shopping online. One of my all-time favorite money-saving websites is Ebates. I’ve been using it for years, and it’s SO SIMPLE. All you need to do is create an account, shop at your favorite online stores, and you earn a small percentage back on all of your orders. That’s it! Seriously; it’s like free money! You’re paid quarterly by check or deposit. I have mine sent directly to my PayPal account. As you can see in the image above, I haven’t done much shopping this past quarter. Nevertheless, I’ll still be getting almost $20 deposited in November for shopping at my favorite stores. Yes, please! Want to give Ebates a try for yourself? Great! You can sign up for free here! There are also some great grocery apps available out there. My favorite is Ibotta, which allows you to take a photo of your receipt, upload it to the app, and receive cash back on different purchases. So awesome and so easy! In addition to getting a small percentage back on your purchases, there are also lots of “first-time buyer” deals out there. Most websites have them, and often it’s the first thing that pops up when you arrive on their site. Keep an eye out, and start saving even more money on your purchases today! Looking for a great place to start? You got it! Some of my favorite first-time-buyer deals include Simply Earth Essential Oils and Modere Clean Living. 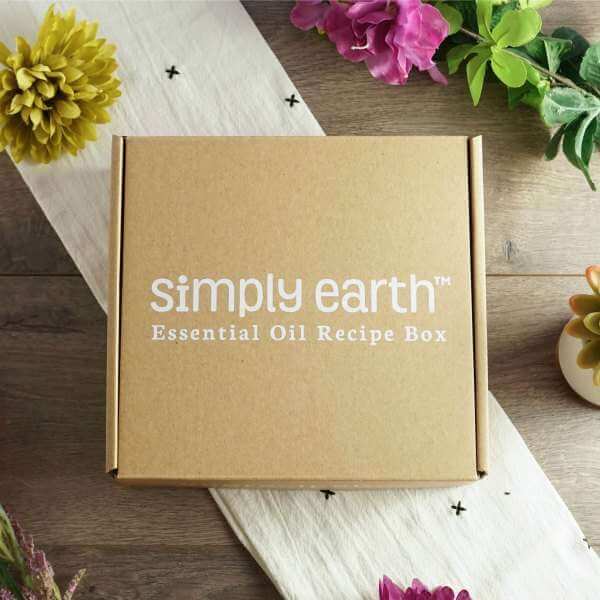 If you’re a first-time buyer with Simply Earth, you can use this link to sign up for a subscription box. When you do, you get 4 full oils PLUS all of the ingredients, containers, and extras you need to make 6 natural recipes… all for $39. And that’s not all! You also receive a big bonus box and a $20 gift card toward future purchases. I mean, helloooooo holiday presents! With a 365-day free return policy, what do you have to lose? Use the referral code IMBUSYBEINGAWESOMEFREE at checkout for all the extra goodies. Sign me up! If anyone on your holiday list lives a clean and natural lifestyle, then you need to check out Modere. This company is like the Amazon Prime of clean living, and it’s my go-to shop for all things home and personal care. If you know someone who would love to receive all-natural and non-toxic products (lotions, skincare etc. ), then be sure you hop over to Modere and use the code 5145749 for $10 off your first order. Who doesn’t love saving money and living clean? Yes, please! 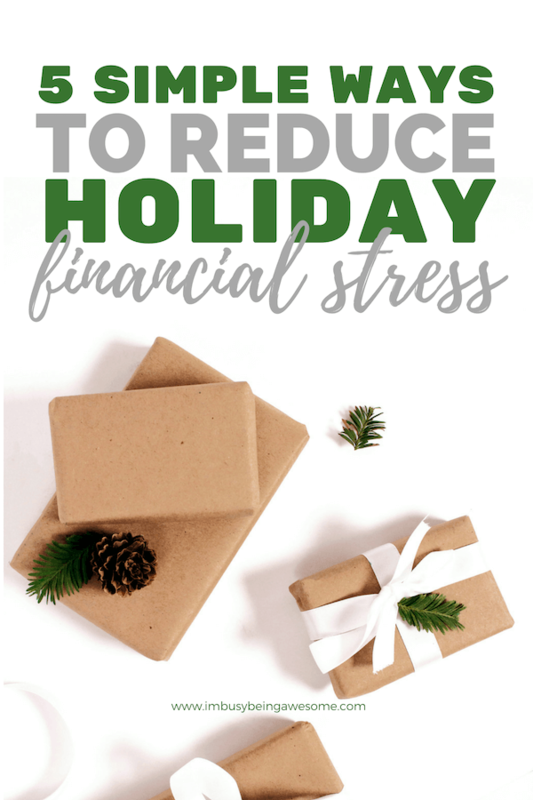 What are your favorite ways to reduce financial holiday stress? Share your tips below! Yes! Budget, budget, budget! I’m amazed at how many people say they don’t budget for the holidays! Great tips! I’m going to share this with my customers on my social media accounts. It’s perfect timing!! Such great post! My family hasn’t done gifts in years!!! These are such great tips, Paula! I love Ebates and have saved so much money using it too. My favorite tips for eliminating holiday stress are planning ahead, shopping online to avoid the crowds and focusing on people not things. Thanks! I love using Ebates! No brainer to get money back. I love how you place an emphasis on doing activities this holiday season rather than buying a bunch of stuff! Thanks! It helps make great memories, doesn’t it? Talking to your family should be easy but isn’t always. I think that is a great tip vs trying to keep up with others and cutting out essentials in your own life. Great Tips! I already have a budget for holiday shopping this year and I’m swearing to follow it. I always set a budget. If it wasn’t budgeted for, I’m not paying for it! Such a great rule, Marta! Great tips! I cannot do anything without a budget. To keep costs down for us, we only buy gifts for our girls and our nieces and nephew. And only on occasion, do my husband and I buy gifts for each other. These are great tips! Setting up a budget and shopping smart really helps! Love these tips!! Hoping for a totally stress free holiday! So true. Will be sharing with my whole family! HeAll of these are great tips. Another tip to add to the list for family get togethers: do a secret Santa among the adults and keep to one small gift for the kids. I love the Secret Santa idea, Margaret. Thanks so much for sharing! One fun way to reduce some holiday money things is having a gift wrapping party, where everyone comes and brings a roll of paper or two or maybe gift bags from previous years that they can share. It won’t maybe save a whole lot but it would be fun! That is BRILLIANT, Nicole. I love that! I love all these tips! I always set a budget, make a list and start my Christmas shopping in August. I was a go-shopping-at-the-last-minute girl and it would be so stressful. Planning makes a huge difference. Plus this time of year should be happy. And your list of holiday activities is great. I’ve done a few, but I’m going to try some new ones this year! That’s awesome, Jenny. You’re totally rocking the holiday prep! Great tips! We always do a holiday budget and it takes a lot of the guesswork out when deciding what to buy. My family is going through some changes this holiday season, and I love these tips for keeping us on track. THANK YOU! Both of those suggestions are BRILLIANT! Thank you for the great tips! So many great tips here! Love me some eBates! Omg… those stats are seriously outstanding. And, not in a good way! I think this is SUCH a good reminder that the holidays are about our loved ones and spending time together. Everything else is just extra. I second your tip to keep eating out to a minimum. After all, there are so many holiday events we go to that other nights out seem over the top! This is great to remember especially when the holidays are fastly approaching! These are some really great tips, thanks! My husband and I also like to DIY gifts. We’re not huge on material possessions to begin with, but making everyone’s gifts feels a little more special and intimate to us. This year, we’re picking and roasting our own tea leaves to send to everyone. Previous years we’ve made soy candles and woodburned gifts. Saves us a bunch of money! I love those DIY ideas, Stephanie! That is so special and unique! There are so many free holiday events and activities! We try to do them ALL! Always best to spend time on friends and family.